Unique Kitchen Solutions in Redditch design, supply and install an exclusive range of new kitchens in Birmingham, Redditch and the Midlands. They also have many years experience in creating bespoke kitchen makeovers in the Midlands by painting your kitchen cupboards and doorsand supplying new floors or worktops as required. 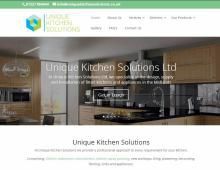 If you are looking for a kitchen makeover in Redditch, Birmingham or Midlands areas, then Unique Kitchen Solutions can help. They offer replacement made to measure kitchen door services, new kitchen cupboards, flooring, worktops, sinks, appliances and kitchen painting in Redditch, Birmingham and throughout the Midlands. Unique Kitchen Solutions in the Midlands specialise in creating affordable new kitchens in Redditch, Birmingham & the Midlands. They provide bespoke kitchen solutions including made to measure cabinets and kitchen door painting. Their range of paint to order kitchen doors in the Midlands are very popular, they include traditional shaker style new kitchens right through to the more contemporary Cashmere Euroline kitchen. Are you looking for high-quality kitchen painting in the Midlands, made to measure kitchen doors in Redditch or made to measure kitchen cabinets in Birmingham? Then contact Unique Kitchen Solutions in the Midlands for a free quotation.